I found *the* original drawing. It was in a box in my car, where I keep all my most important things. The Smithsonian people should put this up somewhere, am I right? How do we make that happen, internet? The Smithsonian Institution is always happy to consider unrestricted donations of art for its collections. However, the Institution accepts only those works of art that truly fill a gap in or complement the collections and then only after careful consideration by museum curators, administrators and directors. The Institution adds to its collections only a tiny percentage of what is offered and typically does not accept unsolicited artwork. 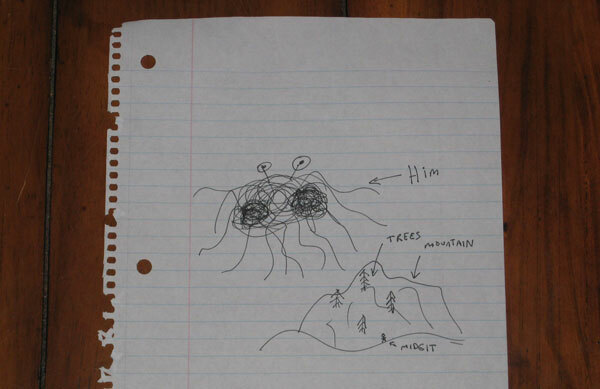 We suggest that you try to find someplace other than the Smithsonian to showcase your drawing and/or promote the Church of the Flying Spaghetti Monster message. Wow! The Smithsonian is really run by pompous po faced gits, isn’t it? perhaps The College of William & Mary can provide a suitable place to house this precious relic?